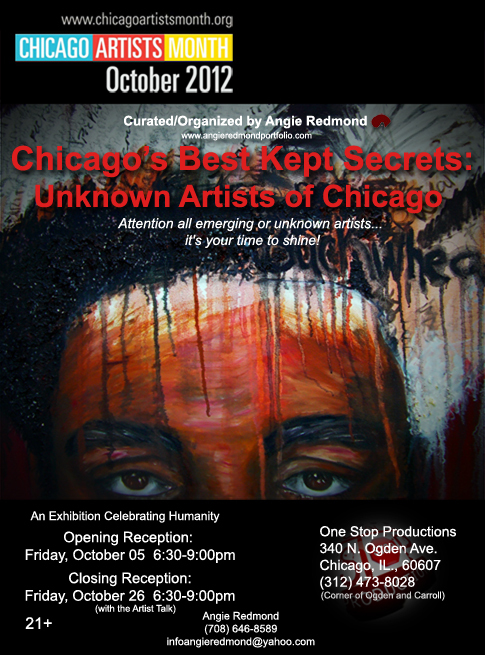 A part of Chicago Artists Month 2012, an art exhibition will be held that is celebrating the work of emerging and unknown artists of Chicago. Chicago’s Best Kept Secrets: Unknown Artists of Chicago will feature the artwork of 11 emerging artists whose work celebrates humanity. From tackling the stigmas of natural African American hair, to capturing the special moments of everyday life through photographs, to igniting a conversation of identifying oneself within their race, Chicago’s Best Kept Secrets: Unknown Artists of Chicago will display a captivating group of work and the talents of the artists who created them. Come celebrate the emerging visual artists of Chicago! There will be an opening reception October 05, 2012 6:30pm-9:00pm and closing reception with the artist talk (October 26, 2012 6:30pm – 9:00pm with food, music, great company, and wonderful art! This entry was posted in Openings and Events and tagged art, Arts, Chicago. Bookmark the permalink.